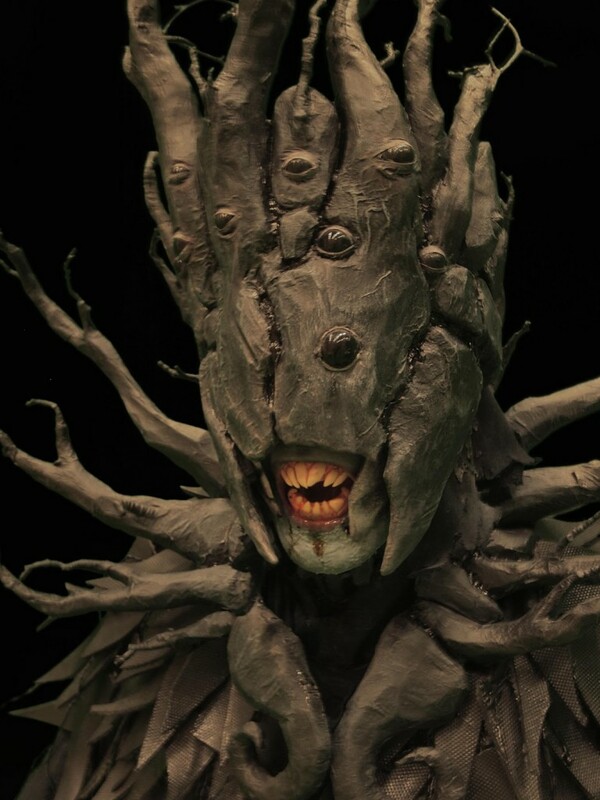 Imagine being abducted by a being like the faun in Pan’s Labyrinth, or by Elder Gods from the Cthulhu Mythos, or djinn, or the grey aliens of American UFO mythology, and kept prisoner (and slave) in their bewilderingly alien world. Imagine being changed by force to better serve them, and then imagine escaping or being spit back out into your own world, forever changed. That’s what a Changeling is. A warning: this class is experimental, wild, and pretty complicated—and the description is long since there’s variety of possible powers and flaws available. I don’t recommend the class for a newbie player’s first character. 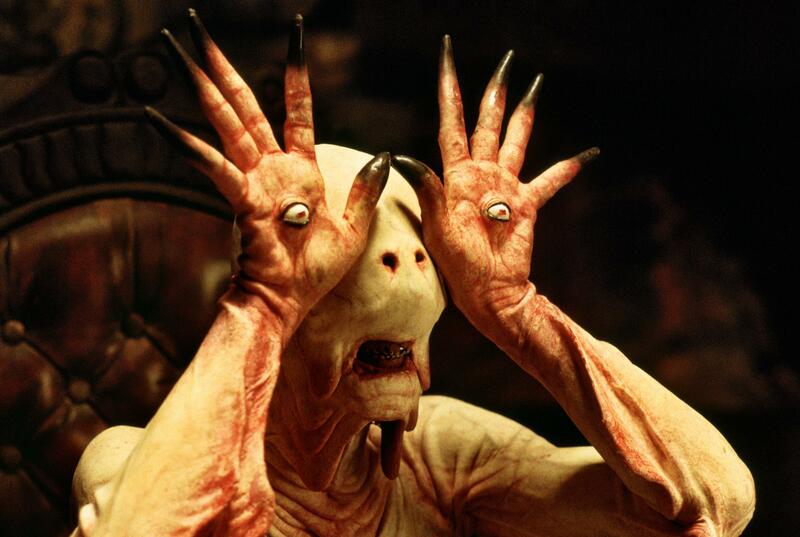 The Pale Man from Pan’s Labyrinth is a great example of what an Abductor from the Elsewhere would be like. 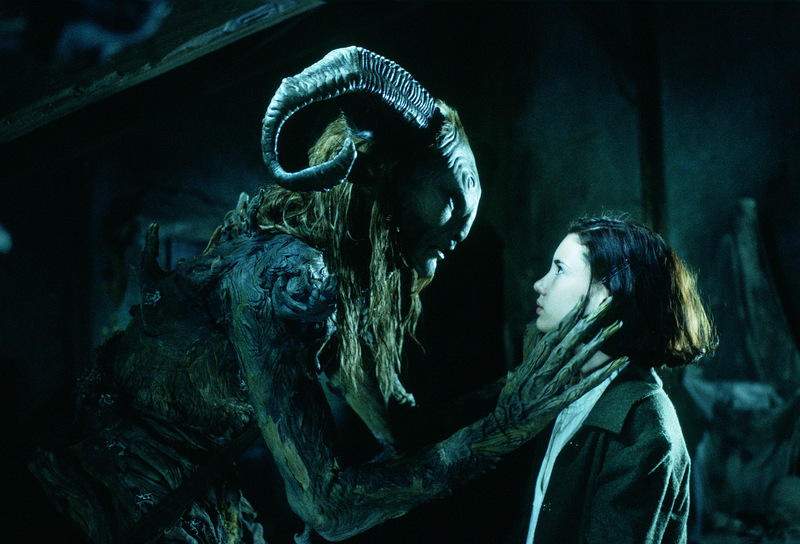 For that matter, the Faun from Pan’s Labyrinth is a classic Abductor type. Changelings are those exceedingly rare individuals who, at some point, underwent the experience of being abducted from the familiar, mortal world to some other world, universe, dimension, plane, or reality. image by Len Yan. Click for source. Specific explanations of this experience vary from culture to culture and time to time, though some form of the experience is seen in practically every culture on Earth. Some speak of traveling to the faerie realm; others, a shamanic journey to the domain of the spirits, imprisonment by demons, a retreat among ascended bodhisattvas; still others speak of mysterious beings from the heavens who whisked them off to other celestial domains, or of horrendous Elder Gods who dwell in the depths of human nightmares, feasting on their thoughts and fears for what felt like eternity. All of these explanations are metaphorical, all of them accurate in some sense and wrong in another. One thing is true of all such stories: the beings that abduct Changelings are dark, mysterious, beautiful, and horrifying all at once. Not sure where this was originally from, but you can click to see where I got it from. All Changelings have experienced at least one period of lost time, ranging anywhere from days to centuries; often, the period of time missed in the mortal realm differs significantly from the subjective time passed Elsewhere. Living Elsewhere may also have aged a character, not necessarily in ways that correspond to the passage of time in either realm. A character abducted as a child could be returned what seems (to other mortals) like mere days later, but with a lifetime of experience in servitude Elsewhere and looking like an old crone. Likewise, a character could be abducted, serve a few months Elsewhere, escape back to the mortal realm, and find himself arriving a century later, looking not a day older. 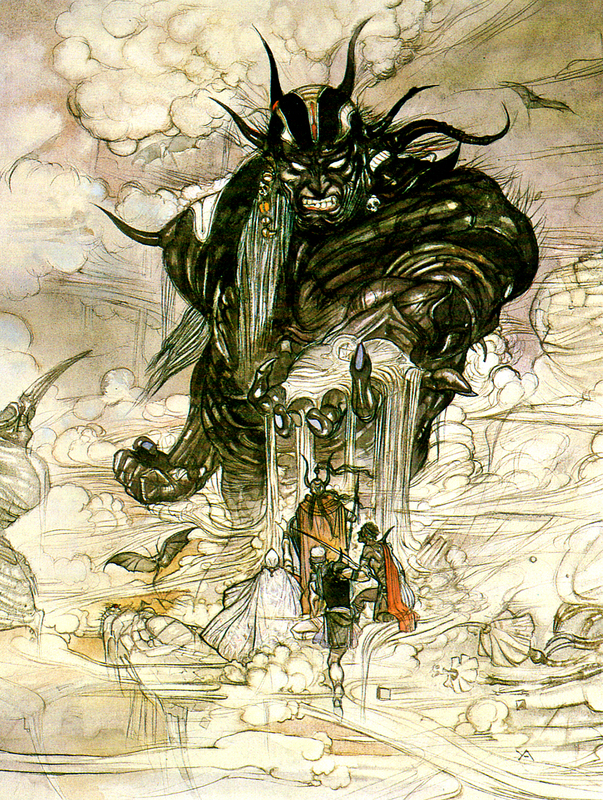 The details for the passage of time in the two realms, and how the character’s appearance was affected in terms of age, are up to the player. Another good example of a potential abductor from the Elsewhere. Changelings can be a member of any major class: Magic-User, Fighter, or Specialist. They cannot be an Alice, Revenant, a Cleric, or a Dagonian. Note, however, that Changeling Magic-Users are unusual—though not because Changelings are not interested in magic! In fact, many Changelings are more attracted than they would otherwise have been to magic, due to their immersion in magic for an extended time. However, intensive study and use of magic only accelerates their accumulation of Taints, which is dangerous for their survival. Likewise, magically powerful Changelings tend to be reclaimed by their Abductor masters more often, and for longer periods of time, than other Changelings. Note: as Changelings are very rare, it is unlikely that more than one such character will exist in a given party of adventurers. The Changeling’s status more than likely is unknown to other characters at the beginning of that character’s career as a Player Character, unless the player can provide a backstory that explains why it should be otherwise. Hang out in the Elsewhere too long, or go back too many times, and you could end up looking like this… Click to see where I got the image. Courtesy of Jacob Petersson at Curiomira. As they live among humans—and are, in fact, human beings who simply have been changed by their experiences in the Elsewhere realm—Changelings who have returned to the mortal realm do not have their own culture or special language. Indeed, their interactions with the denizens of the Elsewhere were conducted in their native tongue, since languages mean nothing to the Abductors, so they do not even learn a language from them. Despite such reassurances, some Changelings prefer to avoid others who have had an experience similar to theirs, perhaps out of fear that two Changelings in the same place may attract the attention of their former Abductor masters and prompt their repatriation to Elsewhere… or, for that matter, others fear that their changed nature may be more noticeable to fellow mortals—and more likely to bring on persecution—if two or more Changelings are gathered together… a fear not completely unwarranted, in fact. 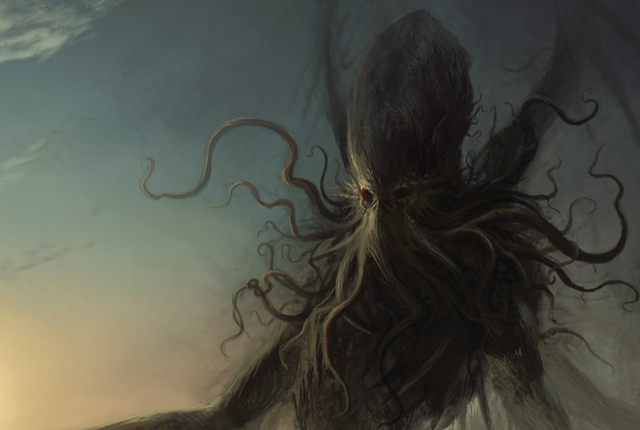 However, others, especially those who are more ambivalent about their return to the mortal realms, tend to be strongly attracted to those who share (and can understand) what is, after all, one of the great defining experiences of their lives. These Changelings form their strongest bonds with other Changelings—either in the form of deep friendships, or torrid romances which, of course, can be complicated by the Changelings’ ties to different masters in the Elsewhere. Due to the stigma brought upon them by their Taints and the difficulties posted by their Allergies (for both, see below), Changelings lead an unusual life, and those who take to adventuring quite often do so because wandering is safer for them than living in one place; or because their endowments are less deemed less remarkable (and less likely to get them killed) by fellow adventurers; or because they come back from the Elsewhere twitchy and broken, eager for thrills that are difficult to find in the mundane mortal world. In our campaign, race does not function as class. 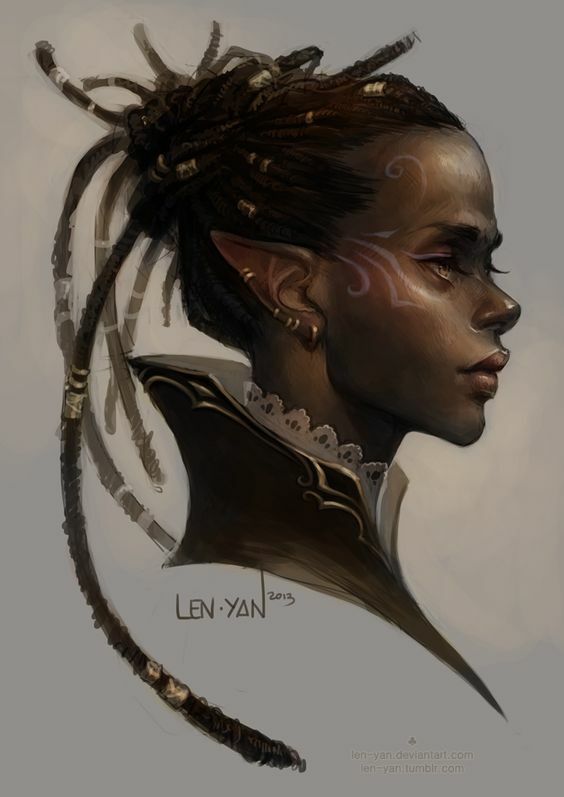 A Changeling has no special ability score modifications for her race status, and her skills and abilties are determined by her class, but she does roll Saving Throws as an Elf (see the Rules & Magic book for the chart). In addition, Changelings gain +1 to their “Lore” skill automatically: the stories and legends they heard as children loom large after their experience in the Elsewhere. All Changelings receive one endowment as a result of living in servitude Elsewhere. Some of these are a natural consequence of living immersed in that magical reality for an extended period, and others are skills or powers gifted to their by their masters in order to render them more effective in their servitude. The specific endowment that a Changeling receives is chosen by the player, and cannot be changed or exchanged for another later on. There are (currently) three Endowments for players to choose from: Occult Affinity, Magical Corruption, and Veil Drawing. The abilities granted by the endowment increase as the Changeling gains levels in her class, with a new cumulative ability added at each level that is a prime number. Some Changelings gain from their experience of the Elsewhere a certain sensivity to how the forces of magic bind into people, places, and things, and develop an ability to manipulate such bindings. 3 Detect Magic: Changeling can specifically detect magical nature in an item, or spellcasting ability or a spell effect on a person, by touch, once per game hour. 5 Identify Magic: Changeling can sense the (general) type of magic associated with a magical object (or a spell effect bound to an individual) by touch alone. The result is always non-specific, so the result would simply be, “necromantic magic” for the following: an item that reanimates a vast horde of the dead; a mirror that grants a Speak with Dead effect; or an undead creature. 11 Transfer Magic: Once per game session, the Changeling can transfer magical energies bound with one item or person to a different item or person, whether the magic energies are a spell effect, a magical power, or an innate magical nature. For example, the Changeling could transfer the necromantic energies that keep a vampire opponent animated to a dead companion, thus reanimating the friend and felling the vampire; she could transfer the effects of a Charm Person spell from a friend to an opponent; or she could transfer an enchantment from a magical item to a mundane item. The effect lasts for 1d10 minutes + 1 minute per level of the Changeling. Because of her exposure to the raw forces of magic in the Elsewhere, the Changeling has the innate ability to discern between types of magic, and eventually to warp specific magical effects to suit her needs. 1 Warp Magic (Basic): Once per game session per five levels, on a successful Saving Throw vs. Magic, the Changeling can attempt to cause a magical spell or spell effect to misfire as it is being cast or invoked, resulting in either a failed casting or, on a critical success, the spell effect of the Changeling’s choice. 3 Warp Magic (Intermediate): Now, on a successful Saving Throw vs. Magic, the Changeling can opt to invert the effect of a spell or magical effect: for example, Magic Missile would become Curative Missile; Speak with Dead would become Silence Dead, temporarily rendering that spirit conversationally inaccessible by magical means, etc. 5 Warp Magic (Advanced). Changeling can warp/alter spell effects, essentially by pulling at the magical threads woven into the fabric of universe. Unlimited attempts are allowed, but only one success is permitted per game session. To attempt to warp a specific spell effect, the character rolls a Saving Throw vs. Magic. A successful save allows the character to redirect the spell either in terms of its target, or in terms of its effect, at her discretion. On a critical success (rolling a natural 1 on the Saving Throw), she can amplify the effect by 50%. 7 Corrupt Spell: Changeling can corrupt the spells in the mind of a spellcaster. For each turn (10 minutes) spent talking with the spellcaster, the Changeling can (on a successful Saving Throw vs. Magic for each spell targeted) corrupt one spell, either forcing it to become a different spell, ruining the spell (so that casting it has no effect), or booby trapping the spell (so that casting invokes a wild magic surge). For spells being converted to different spells, the Changeling must have seen the spell cast before. Otherwise, the Saving Throw is at -4 penalty. Any critical failure on any Saving Throws related to this power will result in the targeted spellcaster (a) realizing the spell targeted has been corrupted, and (b) somehow knowing the Changeling is responsible for this. 13 Invoke Aid: Once per year the Changeling can invoke the aid of her former Abductor master, to warp the reality of the mortal world to serve her needs. The laws of nature and of magic alike are (temporarily) susceptible to this force, for a period determined by the Abductor Master (and laid out in the terms of their hastily negotiated contract), and though the specific effects are determined by the Referee it is up to the Changeling to outline precisely what she has in mind. The Abductor master is contractually obliged to come to her aid—obeying the letter though not necessarily the spirit of the agreement—but in so doing, the Changeling incurs a contracted debt to her master, which must eventually be paid. The Changeling’s relationship with the veil that divides our realm from that of the Adbuctors is particularly adept: she may puncture it, draw it aside, or even, as she grows more powerful, temporarily destroy it at will. 1 Stepping Sidewise: Changeling can “go Elsewhere” for a number of minutes equal to her level. Save vs. Magic or accumulate another Taint or Allergy (and potentially age d10 years) with each use. Note: if the Changeling overstays this duration, Bad Things happen. 5 Dream Voyage (Basic): Changeling can step beyond the veil and travel great distances instantaneously. However, the usual risk of visiting the Elsewhere is here heightened: her Saving Throw to avoid accumulating a Taint suffers a -2 penalty. Also, she may be tasked with some quest in the Elsewhere in order to gain the right of passage. 7 Dream Voyage (Advanced): Changeling can (again, once per cycle of the moon) bring others along with her when she steps beyond the veil to travel great distances instantaneously. Likewise, the group of travelers can be tasked with a quest or deed in order to gain right of passage. 11 Fruits of Elsewhere: Changeling can (once per week of game time) reach through the veil and bring forth smaller objects and denizens of the Elsewhere, such as a key that can open any lock once, or a fruit which immunizes whoever eats it to the effects of poison, or a butterfly that can be bargained with to flap its wings in such a way as to alter the course of history. While the player suggests what she will try to bring forth, the specifics of the result at determined by the Referee, and of course, she must successfully make a Saving Throw vs. Magic to avoid being drawn through the veil to the Elsewhere. 13 Right of Exile: Once per year, the Changeling may enter the Elsewhere with an Entourage—including one unwilling member—to bear the captive to her Abductor master for “trial” and “punishment,” with the latter often involving centuries of servitude … but in so doing, the Changeling incurs a conracted debt to her master, which must eventually be paid. Of course, one does not disappear into a magical realm without corrosive effects upon one’s mind and body alike. All Changelings have two kinds of long-term scarring from the time spent in the Elsewhere: Tarnishing Marks and Allergies. Tarnishing Marks. Elsewhere is a violently chaotic place suffused with magical energies—or, rather, it is a place made of those energies on a fundamental level, and is the place from which those magical energies leak into the characters’ homeworld. These energies, in their most raw form, are simply too powerful for a human being to withstand prolonged exposure without permanent effects. Therefore all Changeling characters will have at least one visible physical trait acquired during their time Elsewhere. The Player should choose from the following for her first Tarnishing Mark. Each time the Changeling behaves in a way that exposes her to the Chaotic forces of the universe—using a magical spell or effect (excluding one of her Endowments), killing a sentient being, or encountering a major supernatural creature, she adds 1% to her Tarnishment score, which is tracked on the back of the character sheet. Then the player rolls a Tarnishment check, rolling d100 against the Tarnishment score. A “success” means she receives another marking, which is determined by rolling on the Tarnishing Marks table below. 1 Nubs of horns hidden in the scalp. Small horns that fit beneath a hood or hat, or in voluminous hair. Large horns that are impossible to conceal. 2 A curious birthmark somewhere on the body. A strange pattern or marking in the skin, covering one limb: text in a strange language, a map, tattoo-like images, etc. The markings spread over a period of weeks to cover the character’s entire body. 3 Unnatural Eyes: they glint brightly in the dark, are a strange color, are thoroughly black or white. Eyes that shine in the dark, or in the presence of magic, or in the presence of any Chaotic being. Eyes that glow like burning embers, even in daylight, or give off a blinding light when the Changeling is angry. 4 Slightly pronounced fangs. Teeth like a cat’s or a dog’s. Fangs and tusks protruding from the character’s mouth. 5 The character develops a small tail, concealable in normal clothing. The tail grows longer, and requires puffy or roomy clothing to fit. The tail is long and thick, and difficult to conceal even in robes. 6 Subtly “otherworldly” appearance: either pointed ears, an ethereal look, large child-like eyes, unnatural slenderness or tallness or shortness, etc. 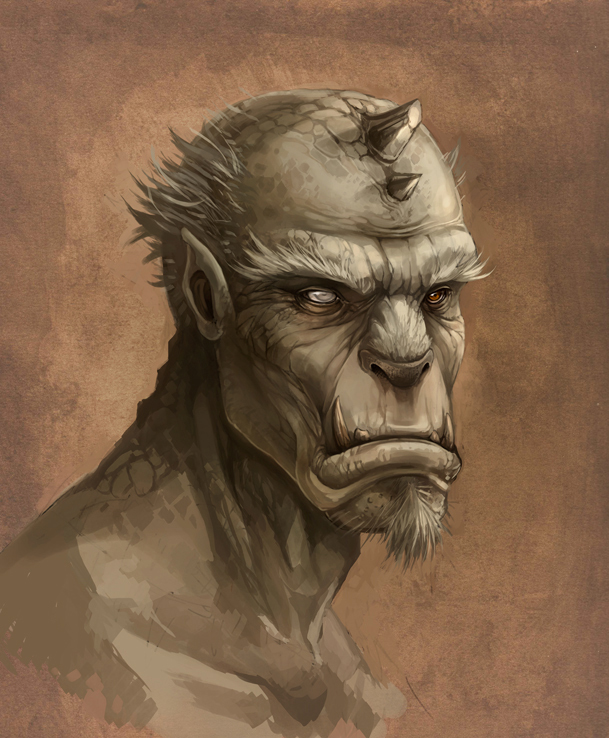 This otherworldly appearance becomes less subtle, with the previous trait becoming more pronounced, and two new traits added. It may still be possible to conceal these traits, with makeup, wardrobe, and theatrical effort. (Walking with bent back, lowering head, etc.) The two traits added at the Moderate stage become more pronounced, and the character will have difficulty hiding these traits even when making a great effort to hide them. 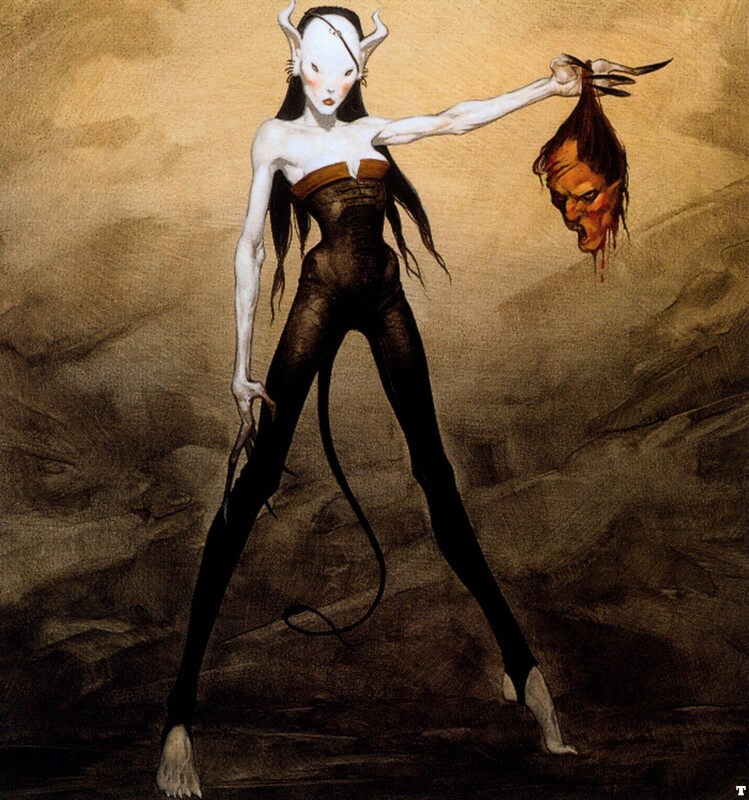 7 Chimerism: the character gets a hint of some animal feature, such as cloven hooves, a birdlike appearance etc.) The chimerism solidifies: shrunken feet callus into hooves, whiskers grow long and catlike, feathers sprout from a random body area. The chimerism spreads: a hooved character develops goat legs, a whiskered one may develops fur on the face, a feathered character may grow vestigial wings. 8 Something weirder, determined by the Referee. The weird mutation grows more pronounced, or the character receives another weird mutation, at the GM’s discretion. The weird mutation grows more pronounced, or the character receives another weird mutation, at the GM’s discretion. Tarnishing marks are permanent: they can be concealed using mundane or magical methods, and they can be temporarily removed by force (usually causing hit point damage: removing horns causes 1d6-1d10 points of damage, for example), but they inevitably grow back. Only very powerful magic can undo the tarnishments that characters accumulate. 1-4 Iron Causes 1d4 points of burn damage on contact, and the character must make a Wisdom check to willingly maintain contact with anything made of iron. 5-7 Silver Causes searing pain, and a harsh reddish rash breaks out after contact. 8 Corpses Panic: the character must make a Wisdom check or flee the presence of the thing after touching it. 9-10 Reflective surfaces Character cannot concentrate properly in the presence of reflective surfaces (such as mirrors, polished metal surfaces, or even still water in good light), as flashbacks from her time spent Elsewhere flood her mind. -4 on all actions, and spellcasting is impossible. 11 Scissors Anytime the character makes contact with scissors, she will somehow cut herself for 1d3hp of damage. She must also make a Saving Throw vs. Magic or be compelled to throw the scissors as far away from her as possible. 12 Wine Any contact with wine requires a Saving Throw vs. Poison to avoid 1d6hp of damage. Ingesting the wine automatically causes 1d8 of poison damage, and immediate inebriation. 13 Children The character must make a Wisdom check to avoid fleeing their presence, as they remind her of the Abductors. To interact with children requires a second Wisdom check at -4 penalty, but, ironically, the character enjoys the equivalent of a +3 Charisma bonus to all social rolls related to interaction with children. 14 Carved stone The sight of carved stone(as in statues, not as in underground tunnels) discomfits the character, causing a -2 on all action rolls in its presence. 15-16 Paper Any paper made from wood pulp repels the character, who cannot use any objects made of paper (including spell books and even spell scrolls not inked onto vellum). If the character is forced to handle paper, she must make a Saving Throw vs. Magic each turn or receive a 1hp paper cut. 17 Cats Cats of all kinds leave the character itchy (-2 on all rolls in the presence of a cat) and frightened. Likewise, cats dislike the character and, unless given a wide berth, will immediately attack her. 18 Music The character experiences (human) music the way most mortals experience dental work in the absence of anaesthetic. A successful Saving Throw vs. Magic is required to willingly remain in its presence, and a -3 penalty is applied to all rolls made in the presence of any kind of music being performed, including songs sung by magical creatures.